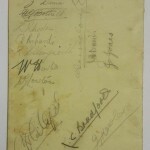 Another dinner menu, this time signed by the Wolves squad who topped Division II in the 1931/32 season to win promotion to the top flight. Wolves were closely followed by Leeds United, who finished just two points behind the West Midlands side to also achieve promotion. 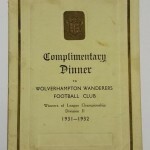 The menu was printed by the Wolverhampton based Paulton Bros firm, who had two premises on Berry Street, which runs behind the Grand Theatre building in the city centre.